The data which is carried in an optical fiber consists of pulses of light energy following each other rapidly. There is a limit to the highest frequency, i.e. how many pulses per second which can be sent into a fiber and be expected to emerge intact at the other end. This is because of a phenomenon known as pulse spreading which limits the “Bandwidth” of the fiber.The pulse sets off down the fiber with an nice square wave shape. As it travels along the fiber it gradually gets wider and the peak intensity decreases. The cause of cause spreading is dispersion. This means that some components of the pulse of light travel at different rates along the fiber. there are two forms of dispersion. 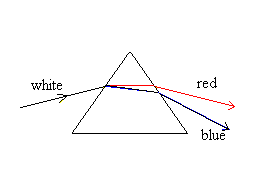 Chromatic dispersion is the variation of refractive index with the wavelength (or the frequency) of the light. Another way of saying this is that each wavelength of light travels through the same material at its own particular speed which is different from that of other wavelengths. 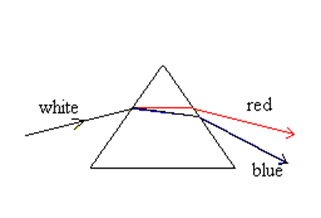 For example, when white light passes through a prism some wavelengths of light bend more because their refractive index is higher, i.e. they travel slower This is what gives us the “Spectrum” of white light. The “red’ and “orange” light travel slowest and so are bent most while the “violet” and “blue” travel fastest and so are bent less. All the other colors lie in between. This means that different wavelengths travelling through an optical fiber also travel at different speeds. This phenomenonis called “Chromatic Dispersion”. In an optical fiber there is another type of dispersion called “Multimode Dispersion”. More oblique rays (lower order modes) travel a shorter distance. These correspond to rays travelling almost parallel to the center line of the fiber and reach the end of fiber sooner. The more zig-zag rays (higher order modes) take a longer route as they pass along the fiber and so reach the end of the fiber later. Or put simply: for various reasons some components of a pulse of light travelling along an optical fibre move faster and other components move slower. So, a pulse which starts off as a narrow burst of light gets wider because some components race ahead while other components lag behind, rather like the runners in a marathon race. The further the pulse travels in the fiber the worse the spreading gets,Pulse spreading limits the maximum frequency of signal which can be sent along a fiber. If signal pulses follow each other too fast then by the time they reach the end fiber they will have merged together and become indistinguishable. This is unacceptable for digital systems which depend on the precise sequence of pulses as a code for information. The Bandwidth is the highest number of pulses per second, that can be carried by the fiber without loss of information due to pulse spreading. A given length of fiber,as explained above has a maximum frequency (bandwidth) which can be sent along it. If we want to increase the bandwidth for the same type of fiber we can achieve this by decreasing the length of the fiber. Another way of saying this is that for a given data rate there is a maximum distance which the data can be sent. NB: The units of BDP are MHz.km (read as megahertz kilometers). They are not MHz/km (read as megahertz per kilometers). This is because the quantity is a product (of bandwidth and distance) and not a ratio. Muitimode fiber is suitable for local area networks (LAN’s) because it can carry enough energy to support all the subscribers to the network. In a LAN the distances involved, however, are small. Little pulse spreading can take place and so the effects of dispersion are unimportant. Multimode Dispersion is eliminated by using Single Mode fiber. The core is so narrow that only one mode can travel. So the amount of pulse spreading in a single mode fiber is greatly reduced from that of a multimode fiber. Chromatic dispersion however remains even in a single mode fiber. Thus even in single mode fiber pulse spreading can occur. But chromatic dispersion can be reduced by careful design of the chemical composition of the glass. The energy carried by a single mode fiber, however, is much less than that carried by a multimode fiber. For this reason single mode fiber is made from extremely low loss, very pure, glass. Single mode low absorption fiber is ideal for telecommunications because pulse spreading is small. In graded index fiber rays of light follow sinusoidal paths. This means that low order modes, i.e. oblique rays, stay close to the center of the fiber, high order modes spend more time near the edge of core. Low order modes travel in the high index part of the core and so travel slowly, whereas high order modes spend. Predominantly more time in the low index part of the core and so travel faster. This way, although the paths are different lengths, all the modes travel the length of the fiber in tandem, i.e., they all reach the end of the fiber at the same time. This eliminates multimode dispersion and reduces pulse spreading. Graded Index fiber has the advantage that it can carry the same amount of energy as multimode fiber. The disadvantage is that this effect takes place at only one wavelength, so the light source has to be a laser diode which has a narrow line width. Attenuation in a fiber is measured using an OTDR (Optical Time-Domain Reflectometer) which looks at the light reflected back long the fiber when a pulse light is sent down the fiber. Another method is to send light from a continuous sou of light and measure the power emerging at the other end of the fiber. The light travelling along a fibre is attenuated, i.e. its intensity decreases as it move along the fiber. This happens for 3 main reasons. We will look at each of these factors in turn. The atoms of any material are capable of absorbing specific wavelengths of light because of their electron orbital structure. This absorption can be observed if you look into the edge of a pane of glass. The light which emerges has a green color because so much red and blue light have been absorbed by the atoms of the glass. In the same way, as light passes along an optical fiber. more and more light is absorbed by the atoms as it continues on its path. In a long fiber cable there may be many splices which join the individual lengths of fiber together. In a Local Area Network there will be many connectors because of the number of subscribers to the system. At each connector and/or splice some light will be reflected back along the fiber in the opposite direction. This will happen even for the most perfect splice or connector. Light reflected backwards does not leave the fiber but is no longer usefully available for the rest of the fiber i.e. it is no longer part of the ongoing light. It is a measure of the light gathering power of the fiber. It lies between 0 and 1. A numerical aperture of 0 means that the fiber gathers no light (corresponding to θA = 0o). A numerical aperture of 1 means that the fiber gathers all the light that falls onto it (corresponding to θA = 90o).